Instructions: Click here to view a larger photo of this project. 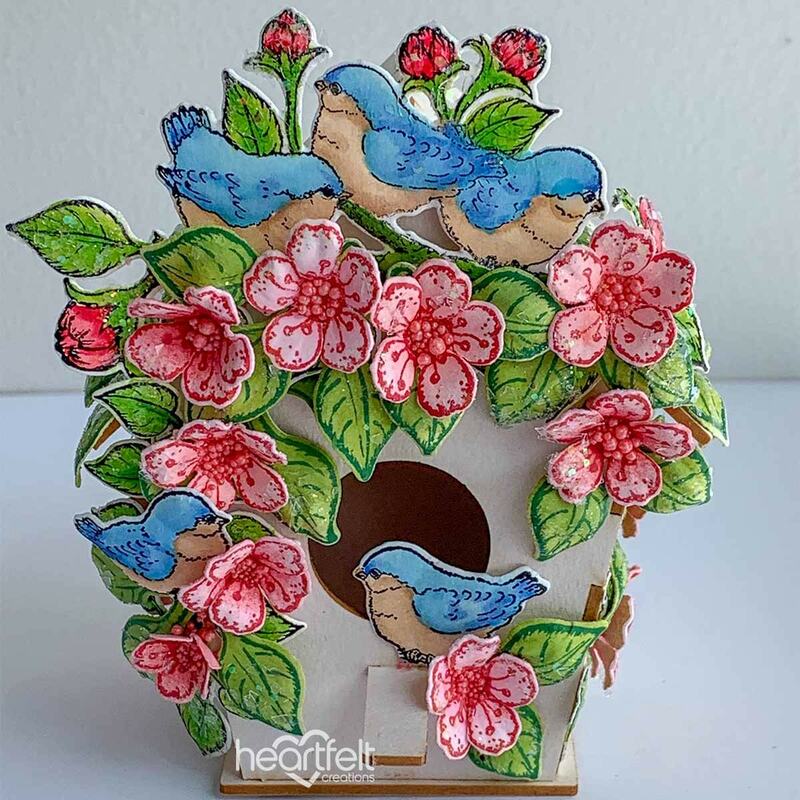 Assemble the bird house as per instructions using Dries Clear glue. Stamp the two branch images from HCPC-3866 Tweet Cherry Blossoms Stamp set in Jet Black ink on the Iris cardstock. Colour with Zig Clean Colour Brush markers and die cut with the coordinating dies. Shape and add Crystal Clear glitter with a fairly dry sponge. Trim and adhere around the sides of the birdhouse. Stamp the branch with bird images from the HCPC-3866 Tweet Cherry Blossoms Stamp set in Jet Black ink on Iris cardstock. Colour with Zig Clean Colour Brush markers and die cut with the coordinating die. Shape and add Crystal Clear glitter using Dries Clear glue on a damp sponge. Adhere to the top of the birdhouse as shown. Stamp the leaves from the HCPC-3866 Tweet Cherry Blossoms Stamp set in Library Green ink on Iris cardstock. Colour with Leaf Green and Olive inks and die cut with the coordinating die. Shape using the coordinating mold and add Crystal Clear glitter to the leaves with Dries Clear glue on a damp sponge. Add over the branches and by the opening to the birdhouse as shown. Stamp the flower images from the HCPC-3866 Tweet Cherry Blossoms Stamp set in Carnation Red ink on Iris cardstock. Colour some images with Carnation Red and some with Pink Peony inks. Die cut with the coordinating dies. 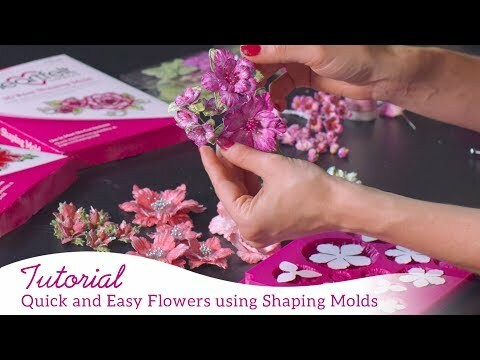 Colour the back of the flowers with Pink Peony ink and shape using the coordinating mold. When dry, add Crystal Clear glitter using Dries Clear glue on a damp sponge. Add Coral Seas Prills to the centres and then add to the branches and one flower over the leaves by the opening. Stamp the bird images from the HCPC-3866 Tweet Cherry Blossoms Stamp set in Jet Black ink on Iris cardstock. Colour with Zig Clean Colour Brush markers and die cut with the coordinating die. Shape using the coordinating mold and then adhere to the opening of the birdhouse and to the left of the birdhouse.